(Jayapura) Scenes of jubilation and free expression have erupted in Jayapura, West Papua as over 20,000 delegates took part in the historic Third Papuan People’s Congress. Thunderous cries of “Papua Merdeka!” filled the streets as tens of thousands of people marched towards the Congress venue Taboria oval (Zaccheus Field) in Abepura, after the Indonesian government prevented the Congress from being held at the Cenderawasih University. Despite threats by Indonesian security forces to derail the Congress, held for only the second time since Indonesia’s invasion in 1963, Papuan delegates openly discussed their rights to self-determination and the pathways to referendum on the future of West Papua. The Third West Papuan People’s Congress was called by the West Papua National Committee and supported by the majority of civil society and political groups across West Papua, including the Papuan Customary Council (DAP) and the West Papua National Authority (WPNA), with the exception of some elements of the armed wing, the TPN/OPM. Over 5000 people had already gathered from 8 am at the Taboria oval, with the numbers continuing to grow steadily throughout the day. Organisers were hoping for up to 40,000 attendees from across Papua, and at least 20,000 were present by Monday afternoon. Approximately 5000 people from Yapen, Waropen, Mamberamo, Manokwari, Sorong, and Jayapura conducted a “long march” rally from Yawa dormitory in Abepura towards the Taboria oval. This march was under the responsibility of WPNA and security was provided by over a thousand Petapa community security personnel, although over 500 police were following behind the march in trucks. Amid tight security due to the threat of violence from Indonesian military and police apparatus, 100 guests were allowed to attend the opening of the Congress which followed with a traditional mumu or feast. 14 pigs were killed with several Paramount customary Chiefs present, as the Sampari dance group performed the traditional dances. The Sampari dance group was infamously persecuted by the Indonesian military as “separatists” after an emotional performance at the Second Papuan Peoples’ Congress in 2000 that depicted the Biak Massacre of 1998. They also danced with the sacred Morning Star flag, banned by Indonesia, which was officially raised around 2pm. Sampari dancers presented the Papuan Collective Leadership, comprising Forkorus Yaboisembut, Eliezer Awom, Septinus Paiki, and the Reverend Edison Waromi of the WPNA, with a traditional Tifa drum, on which he beat a rhythm to officially open the Congress. The initial stages of Congress featured speakers from across Papuan civil society speaking on the need to take strong action to end impunity for human rights abuses and to implement the pathways to self-determination. The Chairman of the Baptist Church in Papua, Sofyan Yoman, was one of the opening speakers on behalf of Papuan Council of Churches who spoke about crimes against humanity being committed daily against the Papuan people. He called upon those present to help in “challenging all the Churches to speak up for human rights for West Papuan people”. “These churches who are living in fear should and must speak out about the atrocities and ongoing injustice in Papua,” Yoman said. Other speakers from across Papuan civil society and customary leaders spoke of the will of the Papuan people being a step closer to realisation through the holding of the Congress, but a long road was still ahead of Papuan to gain freedom or Merdeka. West Papua Media stringers report that preliminary recommendations had been made by both the organising committee and speakers of the makeup of mandated office holders for a new Congress 3 Presidium, that would officially speak for West Papua’s independence movement. In a surprising display of common purpose, delegate have initially endorsed the consideration of office bearers, though no binding decisions have been made. Frans Kapisa of WPNA, had recommended that Forkorus Yaboisembut, the Chairman the Papuan Customary Council – be elected as the inaugural President of the Democratic Republic of West Papua. Participants at Congress have indicated that the deliberations could extend until Friday or beyond, and that any political, logistical, timetable, and office-bearing positions arrived at currently are far from finalised. Despite the jubilation and ability to engage in open and peaceful free expression at Congress, sources report that Indonesian security forces are continuing to gear up for an imminent potential assault or dispersal on the Congress participants. Bintang Papua reported that the announced presence of the Indonesian Coordinating Minister for Political and Security Affairs Djoko Suyanto at the Congress would not be attending, despite the promise by Indonesian President Susilo Bambang Yudhoyono that he would attend to represent Indonesia. However the Papuan-based Indonesian police commander Bigman Tobing has stated that his forces will not be there to cause unrest, merely to protect the proceeding of the Congress. “The joint forces have to obey in order not to cause Unrest in the community,” he said. Local newspapers in Jayapura reported that security forces were preparing 2,200 personnel with armour, “not to frighten the people but to ensure calm’. Unconfirmed reports state that all police leave has been cancelled around the greater Jayapura area. Over 3000 Petapa Community Security Guards have been trained and deployed to provide security for the Congress, with duties of surveillance, detection of intelligence agents, and keeping a physical buffer zone between Papuans and Indonesians to minimise any potential for contact. The proactive but peaceful work of the Petapa force is believed to be stymying any legitimacy of the Indonesian security forces to action, a strategy which according to sources inside Petapa has caused simultaneous frustration and admiration from security forces with apparent lines of communication open between senior police as part of the Papuan security strategy. Petapa personnel are greatly outnumbering the deployed Indonesian security forces, though any direct confrontation would probably see Indonesian weapons being used, a scenario that Petapa have trained for. On Tuesday afternoon, credible local stringers for West Papua Media reported that several hundred fully armed Indonesian police and military took up offensive positions outside the offices of the DPRD. Five Indonesian Army Pansers with .50 calibre machineguns, one company of soldiers from the TNI and 1 SSK (Strategic Company – 150) of Brimob paramilitary police reportedly in full combat gear made manouevres to attempt tho dissolve the gathering. Based on observation by local human rights sources and troop dispositions provided to West Papua Media, surrounding the Congress were 13 Ranger trucks, 24 Army troop transports, 20 Brimob trucks, water cannon, 3 police buses, 2 mobile prisons, Military police/ Provost units (to ensure military discipline), 6 Army Pansers and 4 Police Barracuda Armoured Personnel Carriers, all containing fully armed troops. Approximately 2200 Indonesian security forces were surrounding Congress in a display that participants believed were deliberately designed to intimidate. Security forces also conducted several high profile convoys of armour and hardware throughout the proceedings of Congress, and conducted very visible drills throughout the day and night. 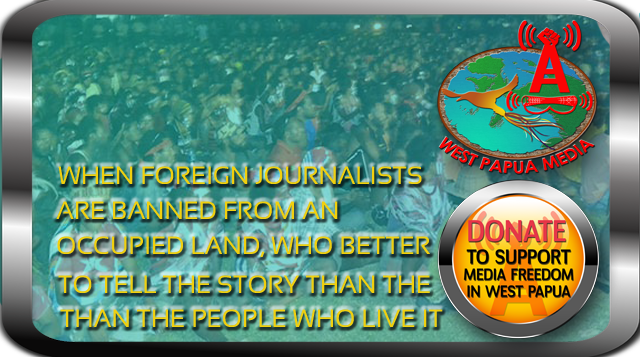 West Papua Media’s stringers have reported that there is a understanding amongst delegates that brutal action from Indonesian security forces seems inevitable, but that the intimidation is not going to stop them from discussing the options for their future. At time of writing a credible source stated that the Joint TNI/Polri security force plan to occupy the field on the morning of October 19, though this has not been fully decided. It is likely that any plan for taking over the field will lead to conflict and bloodshed.